Iceland, (Icelandic: Ísland) is a mountainous island nation in the north Atlantic Ocean, located between Europe and North America. Though not part of the continental mainland, the country is considered Nordic European. The name of the country—Iceland—may not be that appropriate: although 10% of Iceland is covered by glaciers, it has a surprisingly mild climate and countless geothermal hot-spots and hot springs. The native spelling ("Ísland") is appropriate in English as well. Tipping isn't done in Iceland and driving off-road is illegal and destroys the nature. Iceland is a stunningly beautiful place if you enjoy strange and desolate landscapes. The amount of daylight varies dramatically by season. The sun sets briefly each night in June, but the sky doesn't get fully dark before the next sunrise. In the March and September equinoxes, days and nights are of about equal length, as elsewhere in the world. If you go in December, it's almost 20 hours of darkness. Summer is definitely the best time to go, and even then the tourist traffic is still mild. The midnight sun is a beautiful sight and one definitely not to be missed. It is easy to lose track of time when the sun is still up at 23:00. Early or late winter, however, can be surprisingly good times to visit. In late January, daylight is from about 10:00-17:00, prices are lower than in the high season, and the snow-blanketed landscape is eerily beautiful. (Some sites are, however, inaccessible in the winter). Iceland was first inhabited by Nordic and Celtic people in the 9th century CE - tradition says that the first permanent settler was Ingólfur Arnarson, a Norwegian Viking who made his home where Reykjavik now stands. It is thought that Irish monks had temporarily inhabited the island some years prior to this. The Icelandic’s still basically speak the language of the Vikings. Iceland has received a great number of immigrants over the last 10 years. In the last 5 years the population of immigrants has doubled. Most of these people (from Eastern Europe and South East Asia) come for employment. Immigrants in Iceland are now well over 10% of the population. Icelanders also continue to use the old Norse patronymic system, which was formerly in use in Norway, Denmark, Sweden and the Faroe Islands well into the 19th century, until their governments decided that their people should adopt a surname. Despite its name, Iceland has surprisingly mild winters for a country at that latitude owing to the warming effect of the Atlantic Gulf Stream. Iceland enjoys a maritime temperate climate and the average temperature in winter is around 0°C, although the wind chill makes it feel a lot colder. The rapidly changing weather has given rise to the local saying: 'If you don't like the weather, wait five minutes!' It's the kind of place where it's not unusual to get rained on and sunburned at the same time. The summers are cooler and more temperate than elsewhere at the same latitude and the temperature rarely exceeds 20°C. It's a shame most visitors don't stray far from the capital as some of the most memorable sights in Iceland are further afield. There are many excursions offered by tour companies, readily available from any of the main centres such as Reykjavík and Akureyri. They will fly you around and take you out to the glaciers and to the big volcanoes for a reasonable price. However, the cheapest option is to drive around with a rented car since none of these sites have entry fees. Þingvellir National Park (pronounced "THING-vet-lihr") - National Park and a UNESCO World Heritage site 30-50km (20-30 mi) east of Reykjavík. Interesting for a number of reasons: Not only is it the original site of the longest running parliament in the world (the name literally means 'parliamentary fields'), it's also where the North-American and European continental shelf plates are being torn apart. Vatnajökull National Park (VAT-nah-yer-CUDDLE) - Iceland's newest national park was founded on 7 June 2008 and includes the former Skaftafell and Jokulsargljufur National Parks. Vatnajökull National Park is Europe's largest national park at 12,000km², covering about 12 percent of the surface of Iceland. The park is home to Iceland's highest mountain, Hvannadalshnúkur, largest glacier, Vatnajökull, and Europe's largest waterfall in terms of volume discharge, Dettifoss. Snæfellsjökull National Park (SNY-fetls-yer-CUDDLE) - Located on the tip of the Snæfellsnes Peninsula in western Iceland, this park is home to the ice-covered volcanic crater that was the setting for Jules Verne's book Journey to the Center of the Earth. Blue Lagoon - (Icelandic: Bláa Lónið) (BLAU-ah LONE-eeth) Famous outdoor pool and health centre. The spa is in Grindavík on the Reykjanes Peninsula, south-western Iceland. It is situated approximately 13km (8 mi) from the Keflavík International Airport and 39km (24 mi) from Reykjavík. This geothermal spa in the middle of a lava field with its milky blue water is quite surreal. Pre-booking is required and shall be done well in advance to be sure to get your requested time slot. Mývatn (MEE-fatn) - A lake region near Akureyri in the North of Iceland, Mývatn has an unearthly appearance owing to special types of volcanic craters throughout the lake. There are plenty of activities in this area: Smajfall (desert where sulphuric steam comes out of the ground) and Dimmuborgir (aka The Black City aka The Gates of Hell). Geysir - Geothermal hot spot located 10km west of Gullfoss. Geysir itself (from which the English word "geyser" derives) is no longer reliably active, but fortunately Strokkur next door goes off every five to ten minutes. Jökulsárlón(The Jökulsár Lagoon) - This majestic glacial lagoon in southeast Iceland is located near Höfn on Route 1. Breiðamerkurjökull glacier retreated very quickly from 1920 to 1965 leaving this breathtaking lagoon, which is up to 190m deep. Ice breaks off from the glacier keeping the lagoon stocked with icebergs all year round. The James Bond film Die Another Day was filmed here in 2002. Landmannalaugar - A region of outstanding natural beauty reachable by bus (or 4x4) from Reykjavík. Situated in the Interior, it gives a taste of the uninhabited highlands at Iceland’s core. Iceland is a member of the Schengen Agreement. Reykjavik airport in downtown Reykjavik (REK) serves ONLY domestic flights and international flights to Greenland and the Faroe Islands. If you are coming from elsewhere you will be landing at Keflavik international airport (IATA: KEF; ICAO: BIKF), located near Keflavík (pronounced /keplavik/) in the southwest of the country about 40 km from Reykjavík. The airport itself is quite barren; if you have a lengthy layover you should bring books or other forms of entertainment. Be prepared to go through a security screening immediately upon arrival in Iceland if you arrive from outside the EEA or Switzerland. This screening takes place before you go through passport control, but there usually are not further screenings if you do not clear customs. Iceland is not in the EU. This means passengers arriving from outside Iceland whose final destination is Iceland or who have to recheck baggage will have to go through customs controls at the port of entry (usually at Keflavík), regardless of place of origin. However, a duty-free store is present in the arrivals baggage claim area, and one can purchase duty-free products when in transit to the European mainland. The prices of many of these products are actually much cheaper than in downtown Reykjavik, especially of alcohol and cigarettes, so stock up on arrival if you need any of those. Make sure you are aware of the import limits for anything you buy, which includes also any goods you might be having on you before arrival. Duty will be charged for anything over the limit. Airport transfer bus services (called Airport Express , 2,100 ISK one way, and Flybus , 2,950 ISK one way) (2018) run between the airport and Reykjavík bus terminal (45 minutes; 5,950 ISK return, as of April 2018). They can bring you to your hotel for a higher charge of 3,950 ISK (2018) These are the most popular options as they have a guaranteed departure for any scheduled flight possible (arriving and departing). It can be free to hitchhike (outside of the parking lot - most people will be going towards Reykjavik or at least Hafnarfjörður, from where you can take bus 1 to downtown Reykjavik for 420 ISK in exact change or through their app but go figure that out if you have just arrived). The same public bus company (Strætó) also operates bus 55 that stops at the airport's Departures area. Check the route and times (it does not run too often and only during the day) at www.bus.is. The fare is 1,680 ISK (equals four normal tickets within the city, as you will be travelling through four zones), and allows you transfers within Reykjavik if your final destination is not near 55's route. Only and exclusively on Bus 55 one can pay the fare with credit cards, but not on the other routes. Strætó usually have bicycle racks and should take bikes for free but call in advance to confirm and this is also subject to them having space. For more information about how to use Strætó check their website or the Getting around section. The Public Bus System (Strætó) runs Bus 55 between KLE Brottför (Departures KEF Airport) and Hafnarfjörður every two hours for ISK 1,260 (three travel zones), you can also pay with credit cards on Bus 55 but you will not be able to pay with credit cards on the other bus lines, so if you need a transfer ticket to travel further within Reykjavík, be sure to pay ISK 1,680 (for four travel zones) and ask for a "skiptimidi" ("Bus Transfer" in Icelandic). The Airport Information Desk should sell the Strætó Zone Tickets if you don't want to either overpay or fumble for change at every bus ride. For 2500 ISK one way (4,500 ISK return; as of August 2011) Even if you're not staying at one of these hotels they might be within walking distance of where you want to go, so depending on your destination using the Airport Express as a personal taxi service may be economical. Be warned, a metered taxi from the airport to Reykjavík costs about ISK15,000. Nonstop flights on Icelandair are available at the best value from the U.S. and Canada, with gateways in New York City (JFK & Newark), Washington, D.C. (Dulles), Boston, Philadelphia, Chicago (O' Hare), Toronto, Montreal, Vancouver, Minneapolis/St. Paul, Orlando, Tampa, Dallas-Fort Worth, Denver, Seattle, Edmonton, Halifax, Anchorage and as of May 26, 2018, Kansas City. Destinations beyond Iceland include most major European cities (i.e. Amsterdam, Bergen, Birmingham, Brussels, Copenhagen, Frankfurt, Glasgow, Helsinki, London (Heathrow & Gatwick), Madrid, Manchester, Milan, Munich, Oslo, Paris, Stockholm, and Zürich with newly added cities Dusseldorf and Stavanger), with Icelandair's hub-and-spoke network connecting via Keflavík in Iceland. (Please note that some destinations are seasonal.) You can also have a stopover in Iceland en route to Europe at no additional airfare. WOW Air, is a new Icelandic low-cost airline, and the country's second biggest carrier since its 2012 acquisition of rival Iceland Express. WOW air operates flights from KEF to 14 European destinations : Alicante, Amsterdam, Lyon, Salzburg, Zurich, Paris, Stuttgart, Dusseldorf, Berlin, London, Vilnius, Warsaw, Paris, Milan, Dublin, Barcelona, Stockholm, and Copenhagen as well as to Boston, Chicago (O' Hare), Cincinnati, Cleveland, Dallas-Fort Worth, Detroit, Los Angeles, New York City (Newark), Pittsburgh, San Francisco, and Washington, DC in the USA and Toronto and Montreal in Canada. Watch out for their tricks: they allow only 5 kg of hand luggage free of charge and you have to pay for more (2999 ISK or 29 USD for a cabin bag of up to 12 kg as of 2015, and more for hold luggage). Their prices can vary wildly between the different language versions of their website. Also, the price for add-ons (luggage, seats etc) varies depending on the currency you book in (29 USD is around 25% more than 2999 ISK, for example). Once you book in one currency, any services added later will be according to the prices in the same currency. If you need checked in luggage, seat selection etc., on average, Icelandair and Wow Air end up having similar prices on their competing routes (Icelandair tends to charge an arm and a leg where it has a monopoly, unless you are lucky with a promotion). If you are traveling light and don't care about Icelandair's awkward entertainment system, Wow Air is usually cheaper. Namely, on Icelandair, baggage, seat selection, coffee and water are included in the price but both airlines charge for food and snacks! Wow Air advertises itself as "the most punctual airline in Iceland" - they are both usually on time. Icelandair markets itself as a more serious airline, Wow Air is more fun. Air Canada Rouge  operates nonstop seasonal service between Toronto and Reykjavik. Delta Airlines  operates a seasonal, nonstop service between New York (JFK) and Iceland. EasyJet  The popular European low-cost carrier fly from London Luton and Gatwick, Belfast, Bristol, Manchester, Edinburgh & Switzerland, Basel Mulhouse-Freiburg, & Geneva. Germanwings , has seasonal flights from Cologne. SAS offers direct flights from Oslo, with connections to Stockholm and the rest of Scandinavia. Niki  and Air Berlin  also have seasonal flights to a few destinations in Europe. Austrian Airlines  offers nonstop flights from Vienna in the summer months (june to august). Atlantic Airways , the national airline of the Faroe Islands nonstop flights from the Faroe Islands to the REK airport in downtown Reykjavik, and also connections from its European destinations, sometimes at good prices. Scheduled service to Greenland and Faroe Islands, is provided by Air Iceland  and Atlantic Airways  (see above). Due to lack of competition (especially in low season) or heavy demand (in high season), getting to Iceland is sometimes considered expensive. Flexible travellers might consider watching out for offers. The best way to do that is to subscribe to Icelandair and WOW air's newsletters. Both airlines tend to send out emails with offers once every week or so, where you can book affordable seats. These seats are usually bookable within 12 or 24 hours shortly after the email has been sent out. It is also good to shop around, as the other airlines flying to Iceland also have offers occasionally. Smyril Line operate a weekly service from Hirtshals in Denmark. The ferry sails in two nights to Seyðisfjörður, on the east coast of Iceland, via Torshavn, in the Faroe Islands. Keep in mind that the price for the same trip on Norröna (Smyril Line) can vary depending on where you book (a sales office or on one of their websites in different languages: .fo, .dk, .co.uk, .de, .is, that is the price is different on the different websites). Smyril line sails to Seyðisfjörður from where you can catch a bus to Egilsstaðir from where you can either catch a bus via Akureyri or fly directly to Reykjavík local airport. The bus connection through Akureyri to Reykjavik can only be made in one day on a few days in the summer, when there is an afternoon bus from Akureyri to Reykjavik. Besides, the bus trip will most often cost more than the air fare from Egilsstaðir to Reykjavík. Aircraft in Iceland are like buses or trains elsewhere - they're the main form of internal travel other than the roads. Be warned though, that the ride can be a bit bumpy if you're entering one of the fjords like Akureyri. Scheduled service to nearby destinations, including Greenland and Faroe Islands, is provided by Air Iceland  and Atlantic Airways . A car offers the most flexibility for travel around Iceland. Renting a car in Iceland is fairly expensive. Expect to pay no less than $500 USD for a week rental in the summer months. Numerous agencies rent vehicles, and ferries allow individuals to bring their own car with them. Rental prices are high - expect to pay at least ISK4000 per day for a two wheel drive vehicle, and upwards of ISK12,000 per day for a four-wheel drive vehicle; these prices include basic car insurance, but additional insurance may be purchased to protect against damage from gravel or other common mishaps. Read the fine-print however, because the things that usually break (windscreen, tyres, bottom of the car) are usually excluded. Travellers can see the majority of Iceland's sights with a two-wheel drive vehicle, but those interested in venturing into the interior or to places such as Landmannalaugar will need four-wheel drive - and long experience at the wheel - as roads are rough and rivers may need to be crossed. In some locations it's best not to travel alone due to the difficult terrain and weather conditions. Be aware that renting a four wheel drive vehicle may require reservations made several months in advance as these vehicles are in high demand. In addition, renting cars on-location is almost never cheaper than doing so in advance, and car rentals, including at the airport, are not open around the clock. Driving in Iceland is on the right side of the road. Headlights and seat belts for all passengers must be on at all times. There is one main highway, Route 1-Ring Road, that encircles the country. Gas can generally be obtained 24 hours at self-service stations using a charge or credit card, but you will need a personal identification number for that card (if you have a credit card without a PIN number, you can go to a gas station with an attendant, present your card, and ask to pay after pumping). Alternatively, most stations sell prepaid cards that can be used to buy gas after-hours. If traveling around the country, the gas tank should be kept near full because stations can be 100-200 km (62 to 124 mi) apart. Petrol costs (as of winter 2018) are around ISK 225 per litre. Because of Iceland's ever-changing weather, one should keep extra food and know where guesthouses/hotels are located in case of a road closure. Be aware many rental cars take diesel. Most mountain roads are closed until the end of June, or even longer because of wet and muddy conditions which make them totally impassable. When these roads are opened for traffic many of them can only be negotiated by four wheel drive vehicles. The roads requiring four wheel drive (and possibly snow tires) are route numbers with an "F" prefix, e.g. F128. The general speed limit on Icelandic rural roads is 90 km/h on paved surface and 80 km/h on gravel, in urban areas the general speed limit is 50 km/h. There are some exceptions from the general limits that are specifically signed as such (the limit is never higher than 90 though) but be aware that the general speed limit is usually not indicated by signs. Speed cameras are posted around the country, and fines can easily reach ISK 50,000 - 130,000. The DUI limit is 0.05%, with a minimum fine of ISK 70,000 - don't drink and drive. Drivers in Iceland should familiarize themselves with road signs and be prepared for Iceland's unique driving conditions. The roads in Iceland are of a medium to low quality, typically made from slightly rough black basalt. Crossing rivers can be very dangerous, particularly if it has been raining, and should be done with great caution. Driving on gravel can be a challenge, and loss of control on cliff-side roads can easily be fatal. There are two signs in particular that foreigners should pay attention to. 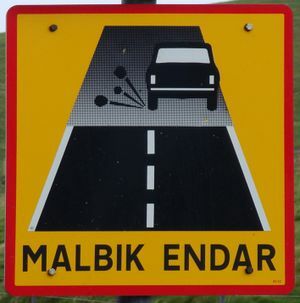 First, "malbik endar" means that the road changes from a paved road to a gravel road. Slow down before these changes, for one can lose control easily. Also "einbreið brú" means that a one-lane bridge is approaching. Arrive at the bridge slowly and assess the situation. If another car has arrived at the bridge first allow them the right of way. If you are traveling by road a great site to check is the Iceland Meteorological Office who have an excellent set of pages including the Icelandic Road Administration on all of the main roads. This website should always be checked for road conditions. It includes real time information on road conditions and traffic. Be sure to also check the Ultimate Guide to Driving in Iceland before renting or driving a car in Iceland for the first time. There are no road tolls on Icelandic roads, and the Hvalfjardargong tunnel located approx. 30 km north of Reykjavik is now toll free also as of 28 September 2018. Road shoulders are few and far between, so if you need to pull over to change a flat tire, there may very well be no place to change that tire without blocking a lane of traffic, especially if you are on a mountain road (which very typically comes with the added bonus of not having guard rails to prevent you from plunging off a cliff). One charming quirk of driving in Iceland is the number of sheep (and sometimes horses) roaming freely on the roads, including the Ring Road. Always slow down when you see one on the road, as it's quite possible that the sheep you see is the mother and her children are about to run onto the road as well to cross over to her. If you’re adventurous and plan on taking a self-drive tour to access some of Iceland’s highlands, then you’ll need to be driving a 4x4 WD. Take notice that off-road driving is illegal in Iceland, as it damages the delicate nature, and is punishable with very high fines, which will likely be more than the cost of your entire trip. It will cost a mandatory minimum fine of ISK 350000 per incident. Off-road driving is in extremely bad form. BSI is the long-distance bus station in Reykjavik from where you can take scheduled buses on various companies, including Discover Iceland  Gray Line Iceland , Trex , Sterna , SBK  (for Reykjanesbær). Be advised that long distance bus travel in Iceland is quite expensive, sometimes more expensive than flying. Besides, very few routes are served more than once a day, which means same day connections are rarely possible. For example, it is impossible to reach Reykjavik from Seyðisfjörður in one day by bus, besides on a few summer days, when there is an afternoon service from Akureyri to Reykjavik. Special offers include 1-4 week unlimited bus travel round the Ring Road (optionally with travel round the West Fjords); one time-unlimited breakable journey around the Ring Road in either direction. Some tours to the interior, in special 4x4 buses, are a much cheaper and more relaxing alternative to driving and serve most major locations (e.g. Landmannalaugar, Thorsmork, Askja etc). Tours to the interior are only scheduled for the summer months. Some of the largest day tours and sightseeing companies include Gray Line Iceland , Icelandic Travel Market  They operate tours all year round and bus routes all over the West, South and East part of the country. SBA-Nordurleid  operates routes all over the North and East of Iceland. A Golden Circle tour is available from Reykjavík which will take you round the Gullfoss waterfall, geysers, the crater and the Mid-Atlantic rift/place of Iceland's first Parliament. Although you don't get much time at each stop the guide will tell you about Iceland's history and some general information. Unfortunately each site can be absolutely jammed with tourists, even if off season, however the sites themselves are still worth it and many have food, restrooms and souvenirs available. The capital area bus system, run by Strætó bs. , is an expensive rural and X-urban system that needs patience and early arrivals to use. Currently, a single fare costs 460 ISK ($4), night fare 920 ISK ($8), though one day pass (until midnight), 24 hour pass (only in app) and three day pass are available for 1,700 ISK ($15), 1,900 ISK ($16) and 4,000 ISK ($34) respectively. Unlike in many other countries, bus drivers do not give back change, so if all you have on you is a 500 Kr. bill, do not expect to get the difference back. You can also buy a set of eleven tickets for 3,000 ISK from major bus stops (also sometimes from the driver). Once you have paid to the driver, you will not get a ticket, unless you ask for one. If you get a ticket, it is valid for any other buses you take within 75 minutes. The most practical form of buying tickets is the app. For using the app you only need the credit or debit card information and a working smartphone. However when you first download the app it requires a working phone number because it will send you a text; if you have just arrived in the country you may not yet have text available to you via phone number. The app can be downloaded from www.straeto.is. In addition of buying tickets you will be able to find the nearest stop, plan the trip and locate buses in real time. Cycling is a good way to experience Iceland, and provides a very different experience to other means of transport. You should bring your own touring bike, as buying a bike locally can be expensive. Traffic in and out of Reykjavík is heavy, otherwise, it's OK. You can cycle safely on the Ring Road, or take the bike on the buses (which are equipped with bicycle racks) serving the Ring Road and do side trips. However, if going self-supported, considering the weather and conditions, it is strongly advisable to have a previous touring experience. Hitchhiking is a cheap way of getting around in Iceland. The country is among the safest in the world, people are quite friendly and the percentage of drivers who do give rides is high, especially in the off-season. However, low traffic in areas outside Reykjavik makes hitchhiking in Iceland an endurance challenge. Even on the main ring-road the frequency of cars is often less than one car per hour in the east. Nearly everybody speaks English and most drivers are interested in conversations. Avoid hitching after nightfall, especially on Friday and Saturday night. Alcohol consumption is high and alcohol-related accidents are not uncommon. Hitchhiking into the interior is tough, but everything works if you have enough time - calculating in days, not in hours. For longer distances or less touristic areas be prepared with some food, water and a tent or similar. The weather can be awful and sometimes spoils the fun of this way of travelling. Check out this  excellent website for road conditions and to get an idea how many cars pass per hour. The HitchWiki website  has some advice for hitchhikers. Check  and  for carpooling options. 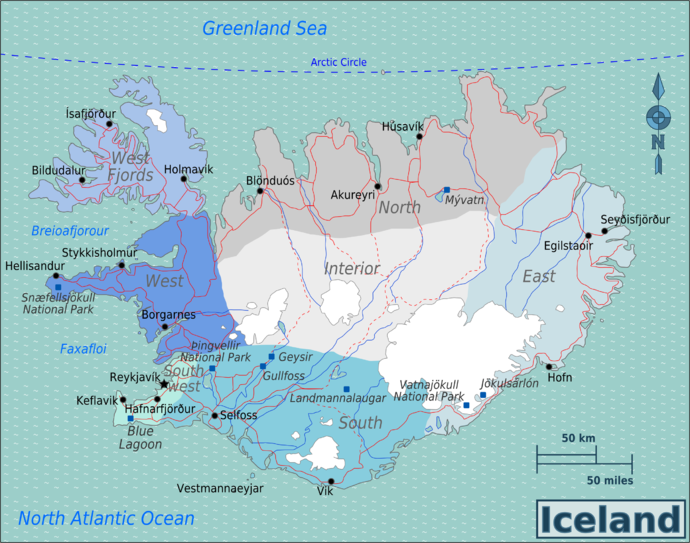 The official language of Iceland is Icelandic (íslenska), which remains very similar to, although not quite the same as 13th-century Norse. Icelandic writing uses the Latin alphabet, but with two characters long ago lost from English: eth (Ð, ð), pronounced like the voiced th of "them", and thorn (Þ, þ), pronounced like the unvoiced th of "thick". Materials in English often substitute "dh" and "th" respectively, so eg. Fjörður is written Fjordhur and þingvellir is written Thingvellir. Loanwords are shunned, and new words are regularly made for concepts like computers, known as tölva ("number-prophetess"). Icelandic is related to the other Scandinavian languages (Danish, Swedish, Norwegian and Faroese), and while written forms may be mutually intelligible, this is hardly the case with spoken forms. Most Icelanders speak English well and have a basic to moderate degree of Danish (with a local accent), as both languages are compulsory in schools, and may understand other Nordic languages. Icelandic college students choose a "fourth language" to study, usually Spanish, German, French, or Italian, but proficiency is most often nonexistent. Even though the majority of Icelanders are competent in English, attempts at speaking Icelandic are always appreciated, and learning some basic greetings and phrases in Icelandic will make your trip much smoother. Icelanders use the comma instead of the decimal sign for integers, i.e. 12,000 means 12, not twelve thousand, whereas 12 000 or 12.000 means twelve thousand. Icelanders use both the 24 and 12 hour system, speaking the 12 hour system and using the 24 hour system for writing. Icelanders do not use PM/AM to indicate morning and afternoon. In Icelandic, "half ten" ("hálf tíu") means half past nine (09:30). When speaking to a person not fluent in English it is best not to use this form to avoid misunderstanding. Dates can be seen abbreviated in a number of ways, but the order is always DAY-MONTH-YEAR; 12.7.08, 120708, or 12/07/08 is 12 July 2008. Icelandic calendars also indicate the number of the week 1 through 52. Iceland uses the metric system only. There is limited knowledge of Imperial or US measurements. In Iceland there is no concept of a ground floor as in the UK. Instead, the entrance level of a building is called the first floor ("jarðhæð"), like in the US. Levels are then counted 1, 2, 3 etc. Foreign television programmes and films are almost always shown in their original language with subtitles. Only children's programmes are dubbed into Icelandic. Consult the Icelandic phrasebook for more information. On Reykjavik streets it is possible to hear more English than Icelandic. Even at the airport, English is the more prominent language on signs. The Blue Lagoon is a geothermal spa and the most famous sight in Iceland. The Gullfoss waterfall is quite spectacular. Geysir, the namesake of all geysers, and its neighbour Strokkur which erupts every five minutes or so. Þingvellir National Park, a beautiful landscape of water-cut lava fields, which is historically important as the site of Iceland's parliament from 930 AD. Vatnajökull glacier is in Southeast Iceland and is Europe's largest glacier. Jökulsárlón, the largest glacier lake in Iceland, is located off Route 1 and part of Vatnajökull glacier. In the colder months, one may frequently get stunning views of the Aurora Borealis, a.k.a. Northern Lights anywhere away from city lights. Iceland offers many hiking opportunities. Hiking in Iceland is no easy business, strong walking boots which support your ankles are recommended as the terrain is usually craggy lava rock or springy moss with hidden holes! Likewise, you'll need to be prepared for strong bursts of sideways rain and sleet, especially in winter and shoulder seasons, and particularly in the mountains. Don't stray into unknown terrain without proper equipment, read up more on hiking in Iceland. Iceland is not well known for skiing or big ski areas but the town of Akureyri in the north has a great little ski area and the mountains of the Troll Peninsula offer world class terrain for ski touring, ski mountaineering and heli skiing. Ice climbing is great with world class frozen waterfalls and plenty of glaciers. Glacier hiking is one of Iceland´s most popular tourist things to do with the area of Skaftafell in the SE being the center of activity. Whale watching available all year from Reykjavik and during the summer from Husavik, but sightings are most common in summer in either place. There are some good opportunities to go snowmobiling and this can provide access to otherwise inaccessable areas. Whitewater rafting is popular. In south you can raft on the big Hvita river. North Iceland has some of the best rivers for rafting, Vestari and Austari Jokulsa. The companies offering rafting are located in Varmahlid. One of them is Bakkaflot with really good facilities (hot pools, accommodation restaurant & drinks) to use after your adventure. The local currency is the Icelandic króna (ISK), and its value collapsed quite dramatically during the 2008 economic crisis. As of March 2018 it has recovered to trade at around €1 = kr 120 and US$1 = kr 100. This has also made local prices more affordable for the visitor, although the prices of imported goods have risen rapidly. Just about every establishment in Iceland will accept a credit card, including taxis, gas stations, souvenir stands, and even the most remote guest house, so it is not necessary to carry large amounts of Icelandic currency. However, due to the currency's instability some credit cards are still wary of króna transactions, so check with your bank before you go and don't rely entirely on plastic. It is best to get cash from an ATM when you arrive, although you could easily go your whole trip just using credit cards. Getting to Iceland can be done fairly cheaply: Icelandair offer many excellent fares and promotions, particularly when flying from the USA or Canada. It's possible to get a flight from New York for as little as $200 (€150/£130) by booking early. Icelandair also offer connections to Europe, but the European low-cost airline, EasyJet, offer cheaper flights from the UK (London, Manchester and Edinburgh) for as little as £25 (€30/$40) + baggage costs. Icelandic budget carrier Iceland Express has recently been bought over by WOW Air, and also offers low-cost fares from major European cities from €80 (£70/$110) + baggage costs. However, as soon as one steps off the plane the situation changes quite drastically - prices in Iceland can be vastly higher than in other parts of Europe due to the high import duties and the 25.5% VAT rate, particularly for alcohol, foreign foods, clothing, etc. For example, many retail goods can be 3-4 times more expensive than in North America. If you are not a permanent resident of Iceland, and you spend 6000 ISK or more on goods that you are bringing out of the country within 3 months of purchase, you can obtain a refund for VAT when leaving Iceland from Keflavik airport. Check out Keflavik Airport's tax refund page. There are many ways to cut costs on transport, accommodation and food, especially if you are in Iceland to see nature and you have some experience and a spirit for adventure. Check out this blog post. Useful discount card schemes exist for tourists, the two most significant being Norden Voyager Card, operated by the Norden Association of Iceland, and Reykjavik City Card, operated by the City of Reykjavik. When shopping for food or other basic necessities, look for the Bónus or Krónan shops, as they offer considerably lower prices than the others. This is at the expense of choice, of course. Downtown Reykjavik is also home to several second-hand stores like Red Cross and Salvation Army, which can come in handy for buying cheap warm layers. Expect to spend around ISK 800-1200 on a pint of beer or glass of wine. In almost all cases buying alcohol at a pub or restaurant is about 4 times the cost of buying it in a grocery store or liquor outlet; kr 1500-2000 for a pizza for one person, kr 440 on a city bus ride and kr 500 for a coffee or espresso drink. A modest hamburger and fries with drink expect ISK2700 cost. Seafood buffet ISK6000. Prices at local grocery stores remain fairly reasonable. The can of soda that is ISK299 at the airport or ISK399 at a restaurant is only ISK84 at a grocery store. Meat is extremely expensive but fish or lamb tend to be less so. Fruits and vegetables can be higher. Buying your food at the grocery stores may be the only option for many, since eating in a restaurant or even a take out for every meal could easily run you ISK6000 a day or more for a minimum intake per person. Hotdog ISK700. Packaged sub sandwich ISK700. Tomato soup with bread ISK1050, piece of chocolate cake ISK900. Cigarettes cost around kr 1400 for a packet of 20. Be aware that the law in Iceland states that cigarettes must not be visible in shops, however most gas stations, supermarkets and newsagents sell them. Buy a duty free carton at the airport when you arrive. Icelandic wool products. Icelandic sheep are a unique breed that produce a soft and durable wool and Icelandic woollen goods (hats, gloves etc.) are soft and warm; don't just buy them for other people if you plan to visit the interior. Arts and crafts. Iceland has a huge number of excellent little craft shops that sell products from musical baskets and wonderful porcelain sculptures to paintings, glasswork and jewellery. The National Galleries tend to carry the same artist's work in the gift shops. Local music. There is a plethora of interesting local music CDs (beyond just Björk and Sigur Rós) worth hunting for. Obscurities worth picking up include Ólafur Arnalds, Eberg , Hera , Retro Stefson, FM Belfast, Worm is Green, Múm, Singapore Sling and Bellatrix. Be warned that many of these CDs are often available back home as imports for much lower prices. CDs tend to cost kr 1500-2000. Icelandic cuisine has changed a lot in the last few decades from involving mainly lamb or fish in some form or other, as the popularity of other types of food has increased. A vegetarian diet is more tricky to maintain but there are several vegetarian restaurants in Reykjavík and vegetarian dishes widely available at other restaurants. Some known vegan restaurants in Reykjavik include: Garðurinn, Glo, AALTO Bistro, Pylsa/Pulsa (vegan sausage platter), and Vinyl. skyr, a yoghurt-like dairy product available in flavoured and unflavoured varieties all over the country. Low in fat and high in protein. Slátur, consists of lifrarpylsa, a sausage made from the offal of sheep, and blóðmör which is similar to lyfrapylsa only with the sheep's blood mixed into it. Iceland is famous for its whale meat, and is one of the few places in the world where it is possible to eat Minke whale. The common assumption is that whale meat is a traditional dish in Iceland, and while it is available in restaurants this is generally for the tourist experience. Whaling has long been a tradition in Iceland, albeit it has become a controversial issue in recent times. However, most restaurants that cater to tourists will sell whale meat, and if you are feeling a little more adventurous some places serve smoked puffin. However, the IUCN classifies the puffins as endangered, which is why they should not be eaten. During the Þorri season (late January-Early February) many Icelanders enjoy Þorramatur, a selection of traditional Icelandic cuisine which usually contain the following: hákarl (putrefied shark cubes), Sviðasulta (brawn [head cheese] made from svið), Lundabaggi (Sheep's fat) and hrútspungar (pickled ram's testicles). Þorramatur is usually served at gatherings known as Þorrablót. If you find yourself invited to a Þorrablót do not be afraid to (politely) refuse some of the more unpalatable delicacies, as many Icelanders chose to do so as well. Don't worry about going hungry, though, as many of the more "normal" foods mentioned above are almost always available too. If uncertain which is which, do not be afraid to ask the caterers for assistance. A similar event to Þorrablót is Þorláksmessa, celebrated on 23 December each year. During this day you might find yourself invited to skötuveislur where cured skate is served. As with Þorrablót, you can politely refuse to partake in the skate (other type of fish is usually served alongside it for the less adventurous). A word of warning though, the pungent smell that accompanies the cooking of cured skate is very strong and sticks to hair and clothing very easily. Do not wear formal (expensive) clothing at these gatherings, especially not clothing you intend to wear during Christmas. Any Icelanders' first choice of fast food is usually the pylsa or hot dog. It is usually served with a choice of fried onions, fresh onions, ketchup, mustard and remoulade. It is cheap compared with other fast food staples at around 250 kr, and is sold in every one of the small convenience stores/eateries/video rentals/sweet shops that litter Icelandic towns. Baked goods are costly. American baked goods even more so. 3 x Krispy Creme donuts in a standard grocery store ISK1400 seen Oct. 2018. Even plain store brand donuts are around ISK150 each. ISK 2000 - 2800 for a hamburger. ISK 3000 - 8000 for a three-course meal in a restaurant. Tap water is safe to drink in Iceland and it has some of the cleanest water in the world. Coffee is easy to find and is comparable to what is found throughout Europe. Juices are generally imported and made from concentrate. Alcoholic drinks are very expensive compared to the UK and USA - as an example, a pint of Viking beer in a bar will cost approximately ISK 900. Liquor can be purchased at licensed bars, restaurants, or Vínbúðin , the state monopoly (locally known as Ríkið: "the state") liquor bought there is much cheaper than at bars, there you pay kr 350 for the same beer you paid kr 900 for at the bar. The local Icelandic drinks such as Brennivín ("Black death") contain a fairly high alcohol content, so pace yourself while at the bars. Visitors arriving by air should note that there is a duty-free store for arriving passengers where they can buy cheap alcohol (at least cheap compared to Iceland). To find the duty-free store, just follow the Icelanders. No Icelander in their right mind will pass the duty free store upon arrival! Import allowances can be found on the customs website: . If you're visiting in summertime you won't regret bringing an eye mask with you. During the height of summer there is no actual darkness and in the north, the sun might just dip for a few minutes below the horizon. The hotels are usually fairly basic around the island but you can usually get a room even in August just by phoning them up and reserving it before you get there. They are very clean and well maintained, light and airy with nothing at all that could even remotely be considered 'dingy'. They are expensive though. Guesthouses are between hotels and hostels in prices and services. At some times if traveling in groups the guesthouses can be cheaper than the hostels. Guesthouses will usually have more space than a hostel with a shared bathroom that is cleaner and less crowded. Icelandic Farm Holidays is a vast network of rural accommodation all around Iceland including guesthouses, bed and breakfasts, country hotels, self-catering cottages, apartments and traditional farms. Most are within easy reach of key routes and popular holiday attractions but many are also tucked away in villages or rural settings off the beaten track. Categories range from simple yet comfortable rooms with shared bathrooms to more elaborate rooms with private bathrooms. Local food is often available, also activities such as horse riding tours, guided walks or a chance to take part in farm activities. Icelandic Farm Holidays is a membership-based operation. The Icelandic Farm Holidays Association was founded by farmers in 1980 and the travel agency by the same name is still majority-owned by the farmers themselves. Members need to fulfil strict quality standards and are inspected on a regular basis. Travel Service Bakkaflot in Varmahlid, north Iceland, offers all kind of accommodation. You can rent a summerhouse for your family, stay in a fairly new, small but cozy cabin with ensuite facilities or if you are looking for cheaper options, they have sleeping accommodation in the main guesthouse. They have restaurant facilities, swimming pool and hot pools and whitewater rafting also. Iceland has many hostels throughout the entire country. 37 of them belong to Hostelling International Iceland  and it is best it to buy the international membership card (if you do not have it already), if you are staying for four or more nights at HI hostels in Iceland or abroad within the next year. Bring your bed-linen or sleeping bag to avoid extra costs. Also it is advisable to book ahead especially for hostels in more remote locations during busy periods such as the summer. A budget alternative to hostels can sometimes be found through short-term accommodation rentals sites.The cheapest options will usually consist of a private room in someone's home or apartment, along with kitchen and bathroom access, and this can often work out as the same price or even cheaper for two persons compared to a hostel dorm, and significantly cheaper than hotels, in Reykjavik at least. Some hosts will also rent their car to guests for a much cheaper rate than car rental companies, and do airport pickups. If you're travelling on a budget, camping is your best bet. There are sites located throughout the country, especially at places you'd want to visit. They range from fully-equipped (hot showers, washing machines, cooking facilities) to farmers' fields with a cold-water tap. Expect to pay 500-1000 Kr per person per night. If you intend to camp in Iceland you must be prepared for the cold, 3 season sleeping bags are essential and an inner, I would also highly recommend thick pyjamas and a warm hat! A bedding roll is also useful as you may end up sleeping on very rough ground...and that's just not very comfortable at all! Don't wait until last minute to find a place to camp. Campers and mobile homes have become immensely popular among Icelanders and they take up a lot of space. You could arrive at a large camping ground that's so filled up with campers and mobile homes that you'll have no place to pitch your tent. Trekkers will need to use some of the mountain huts, either government or privately-run. These range from dormitory accommodation to fully-staffed facilities. Booking ahead is likely to be necessary at popular times of year (and they may only be accessible in summertime). The huts on the Laugavegur trail in particular need to be booked with a long time in advance, as it is the most popular trekking trail in Iceland with tourists and locals alike. Don't bother attempting to sleep in the Keflavík Airport overnight. Sleeping in the airport is frowned upon by the airport staff, but tolerated if discreet. Setting up with a bedroll or something is not allowed and will be dealt with. It's far better to find a hotel in Keflavík or Reykjavík before arrival. If there are no flights to be serviced in the middle of the night (which is most often the case) the airport is closed for a few hours at night and you might have to stand outside in the rain and wind. Don't bet there won't be some. Work permits are required for citizens of most countries. The exceptions are citizens of the Nordic Countries (Greenland, Faroe Islands, Denmark, Norway, Sweden, Finland) and EU/EEA countries. There are no restrictions on the latest entrants into the EU. Work permits can be extremely difficult to get if you do not come from any of the aforementioned countries, as Iceland has a relatively strict immigration policy and employers are obligated to consider Icelandic or EU citizens above all other applicants. It is also worth mentioning that as a small nation, a great deal of emphasis is placed on family ties and personal relationships; therefore it can be difficult to find a job in Iceland without personally knowing someone in a company. Beware of offers for contracted work in Iceland. Your wage levels may be lower than average and your rights may be affected. Iceland is a highly unionised society with over 90% of the workforce in labour unions. A great resource is the Directorate of Labour the Directorate of Labour website. Iceland is one of the safest places in the world, so there is almost no chance of getting robbed or harassed. This, however, excludes Reykjavík, which has recently begun to suffer instances of petty theft and night-time violence. Use common sense when sampling the night life and be alert. The greatest dangers to tourists in Iceland are found in the nature. Always do what the signs tell you to do. If there are no signs, use common sense. Every year, quite a few tourists get hurt, even killed, in the mountains or on the seas, usually after having been given unheeded warnings. For example, do not approach a glacier front, big waves on the coast, or a big waterfall unless you know what you're doing, and do not walk on glaciers without proper training and equipment. Iceland is a volcanically active country and you can get caught in an eruption, but chances of that are extremely low. When hiking or skiing, be prepared for a sudden shift in the weather, as these can happen very quickly in Iceland. If unsure about conditions, ask locals or go on a guided tour. Icelanders are taught to respect nature's power and take care of themselves outdoors in the wilderness from childhood, so you usually won't find fences or warning signs even at the most dangerous places. Malbik Endar: Paved road ends. Einbreið Brú: Single-lane bridge. The closer driver has priority when crossing the bridge. Some longer bridges include passing points. Driving around Iceland can be difficult or even dangerous. Inform yourself of local conditions and make sure your vehicle and driving skills are up to the task. The Route 1-Ring Road around the country is well maintained, and paved for all but a few miles north of Djúpivogur. Be aware that many roads are unpaved and can turn into slippery mud during the summer. There have been a number of instances where foreigners, unprepared for Icelandic roads, have had accidents, some of them fatal. Since the roads are very quiet and the distances between settlements great, some Icelanders abuse this by speeding considerably. Sheep sometimes roam near the roads or even on them, so always have your eyes open and be on the lookout for sheep, as they tend to wait for cars before crossing the roads. The southern coast of Iceland's Route 1 is very flat and windy (Selfoss to Jokulsarlon) which can cause sandstorms in the summer, and drifting snow in the winter. Fortunately the Icelandic road administration is always kept up to date of driving conditions, check this before any drive. If you find yourself caught in a sandstorm, do not stop in the road! Continue slowly until you find an appropriate place to pull over and wait it out. If possible, find somewhere sheltered as sandstorms will damage the paintwork on cars. Check out the following website for up-to-date road-condition information: . If you are travelling into the highlands please also leave your travel plans on this website. Road numbers starting with an F are for 4x4 vehicles only, and are usually simple dirt paths made by a road grader and it's not uncommon that river crossings are required. Many F-roads are closed due to extremely bad road conditions from October to mid-June. Speed limits on highways are 90 km/h on paved roads and 80 km/h on unpaved roads. The give way rule is universal. On roads without the "Yellow Diamond" sign, all traffic from your right hand side has the right of way; you must yield to traffic from any road to your right, except from private areas such as parking lots. Headlights are mandatory even during daylight. The general speed limit is 90 km/h in the country side and on motorways, and 50 km/h in urban areas. Note that there are no specific rules for change of speed limit (as in some other countries) when driving conditions change. The driver is expected to adjust speed downward to a safe level in for instance fog, heavy rain or snow. Don't drink and drive. Your blood alcohol concentration must not exceed 0.02 ‰. One small beer can be enough. This rule is strictly enforced and violators risk a huge fine, a long (or even indefinite) suspension of the driver's licence and a prison sentence. On typical Icelandic two-lane road with a narrow shoulder, overtaking is only allowed on long straightaways with plenty visibility. Overtake only if really necessary, consider alternatives like taking a short break. Using one's vehicle horn is considered impolite and may result in a fine unless used for an emergency. Right turn on red is illegal. The Icelandic Narcotics Police has a very strict policy on drugs; minimum fine for possession of under 1 gram (3/100 of an oz.) of any illegal substance can result in a fine of over 30,000 ISK ($245/€214/£168 in April 2016). For the protection of children, Iceland has a strictly enforced nationwide curfew. Children aged 12 or lower are not allowed to wander outside alone after 20:00, they must be accompanied by a responsible adult. Minors aged between 13 and 16 can not wander outside alone after 22:00 unless they are on their way home or from a recognized event organized by a school, sports organization or youth club. From 1 May to 1 September, all minors 16 and under are allowed to wander alone for two extra hours. The medical facilities in Iceland are good and available free to European Union citizens with a valid EHIC form or its replacement ID card. Scandinavian citizens must show valid passport and medical insurance to be treated. Infectious diseases aren't a problem in Iceland. Inoculations aren't required except if you are arriving from countries that suffer from infectious diseases like cholera. Iceland holds the European record for number of people with chlamydia (STD), use a condom! The biggest threat to your health is likely to be accidental injury or bad weather. Always make sure you have more than adequately warm and waterproof clothing. Selection of appropriate clothing is especially important in Iceland and can even be a matter of life and death. Exercise extra caution in geothermal areas: What may appear to be solid ground can sometimes not be so solid, breaking from underneath your feet with you falling into potentially deadly boiling water. The water quality in Iceland is excellent and tap water is always drinkable. The hygiene in public kitchens is very good, and food poisoning rarely happens to tourists. Ms. Pétursdóttir or Ms. Guðrún? Iceland maintains another Norse tradition: the custom of using patronyms rather than surnames. An Icelander's given name is followed by his or her parent's first name (usually the father's), in the genitive case, and the suffix -son or -dóttir, e.g. Guðrún Pétursdóttir (Guðrún, Pétur's daughter). Members of the same family can therefore have many different "surnames", which can sometimes create confusion for visitors. Because of the patronymic last names Icelanders use first names, e.g. phone books are alphabetized by first name rather than last name. This also applies when addressing an individual. Icelanders would never expect to be addressed as Mr. or Ms. Jónsson/-dóttir no matter how important they might be. Also, titles are generally not used, so being addressed as Ms./Miss/Mrs./Mr. so-and-so would make many an Icelander uncomfortable. Some Icelanders believe in the hidden people — called huldufólk — and a few claim to have seen them. They are analogous to elves, but are often considered separate. There is even a museum in Reykjavík devoted to the hidden people. This is an ancient Icelandic belief and most Icelanders respect the tradition. Many tourists, including other Europeans, see Icelanders as gruff and unapproachable. This is generally just a first impression and most people are friendly and helpful. It is customary for one to take one's shoes off after entering private homes. In case your hosts do not mind, they will say so. Tipping is not expected in Iceland; some Icelandic companies have started having a tipping jar next to the cash register but these are generally ignored. Punctuality is not as important in Iceland as it is in many other northern European countries. People may often not appear until 15 minutes later than the stated time, and even much later than that for parties or other social gatherings. It is not uncommon for an Icelander to ask a foreigner for his or her opinion of Iceland as a first question. The standard question is: "How do you like Iceland?" Iceland is one of only a few countries with an active whaling industry. If you have an anti-whaling position and voice your conviction, you may receive a rebuttal from Icelanders who have strong pro-whaling convictions. Don't litter, don't empty your RV's septic tanks any old place, and please don't drive, bike, jump, et.c, on the moss. It's delicate and takes a long time to heal. You can buy a local SIM card, if you have an unlocked mobile phone. The biggest companies are Síminn, Vodafone and Nova. Compare prices on their websites in advance. The airline you fly in on might be selling a prepaid package for a lower price, as it is duty free. If not, try buying one at the duty free store at the airport. If you have a smartphone, you can buy packages to use the internet through the cellular network. Most hotels, guesthouses, hostels, cafés etc. have a working Wi-Fi network. There are a couple of public computers at the University of Iceland and the National Library that you can use for free and without the need to log in.